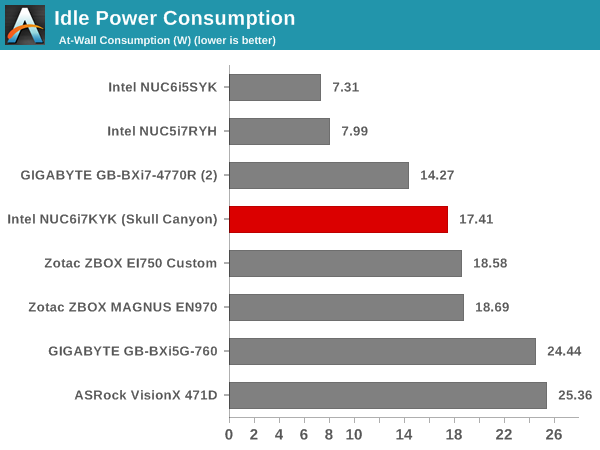 The power consumption at the wall was measured with a 1080p display being driven through the HDMI port. 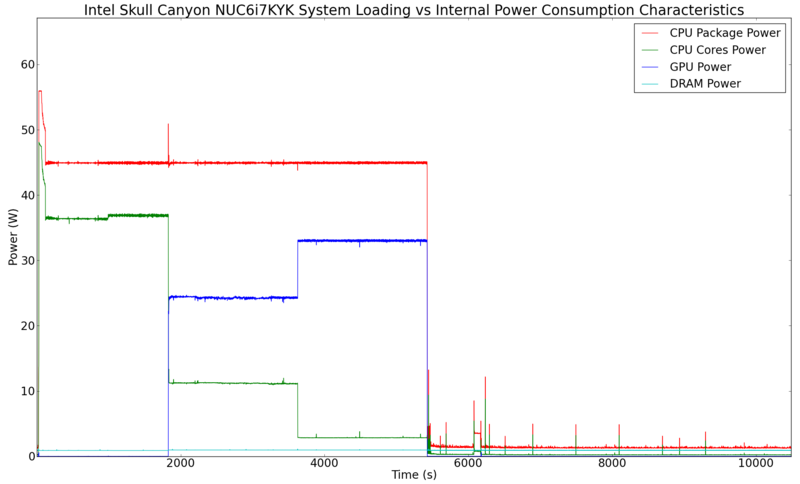 In the graphs below, we compare the idle and load power of the Intel NUC6i7KYK (Skull Canyon) with other low power PCs evaluated before. 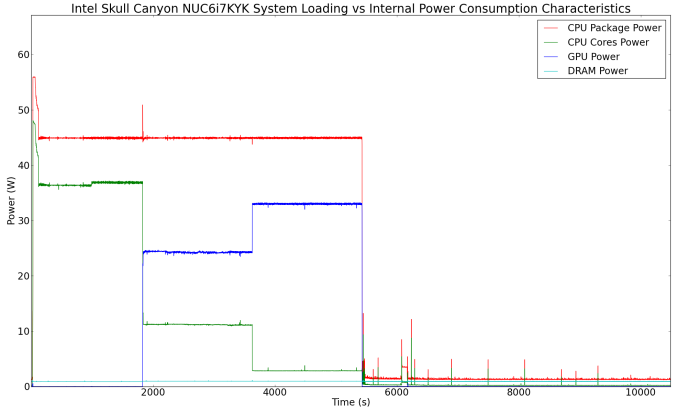 For load power consumption, we ran Furmark 1.12.0 and Prime95 v27.9 together. The idle number is a bit disappointing, though, I assume that a change in the BIOS to the low power profile could help improve things. 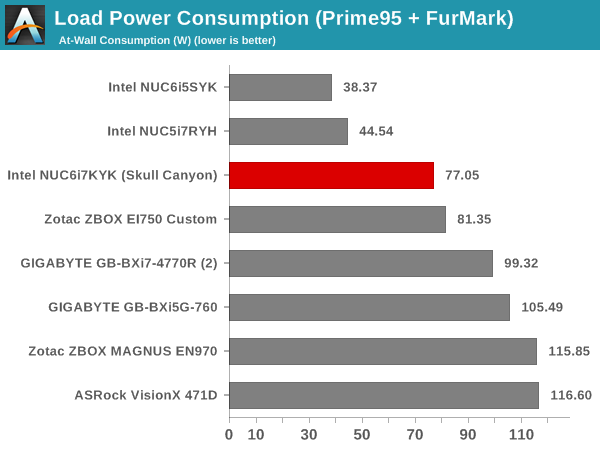 Otherwise, the idle number is just slightly higher than what is typical for a system with a 45W TDP CPU and a PCIe M.2 SSD. 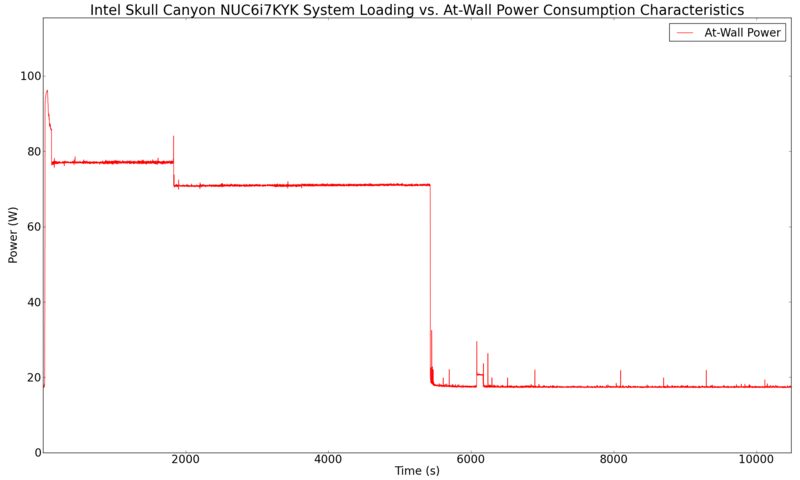 The load power number in the graph above is the maximum sustained value. As we can see from the graphs below, instantaneous peak numbers can go as high as 95W. Addition of bus-powered USB devices will also tend to drive up this number further. Our thermal stress routine starts with the system at idle, followed by 30 minutes of pure CPU loading. This is followed by another 30 minutes of both CPU and GPU being loaded simultaneously. 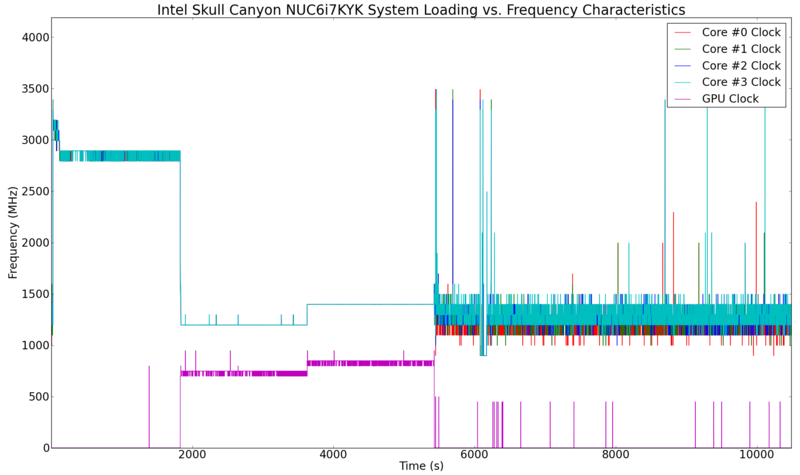 After this, the CPU load gets removed, allowing the GPU to be loaded alone for another 30 minutes. The various clocks in the system as well as the temperatures within the unit are presented below. 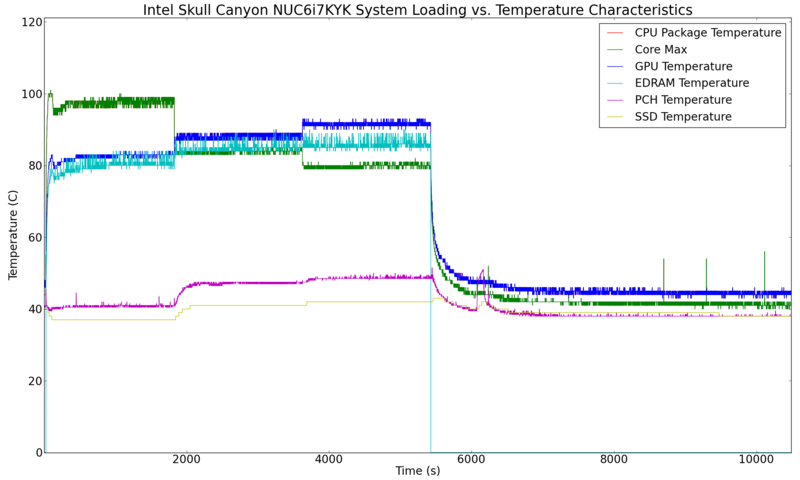 The graph below present the power consumption profile of various blocks in the CPU package during the course of our thermal stress. Following that, we have the power consumption at the wall for the system during the same period. According to the official specifications, the junction temperature of the Core i7-6770HQ is 100 C. Unfortunately, the cooling solution is not able to prevent the CPU from hitting it with turbo speeds activated. However, the frequency does remain above the base 2.6 GHz throughout the pure CPU loading segment. The package power settles down to a steady 45W, and that continues throughout the duration of our test. Our only concern is that the cooling solution keeps the temperature of the cores too close to the junction temperature during periods of heavy CPU load. Once the load gets distributed across both the CPU and the GPU, we see the package come down to around 90C. Another important aspect to keep note of while evaluating mini-PCs is the chassis temperature. 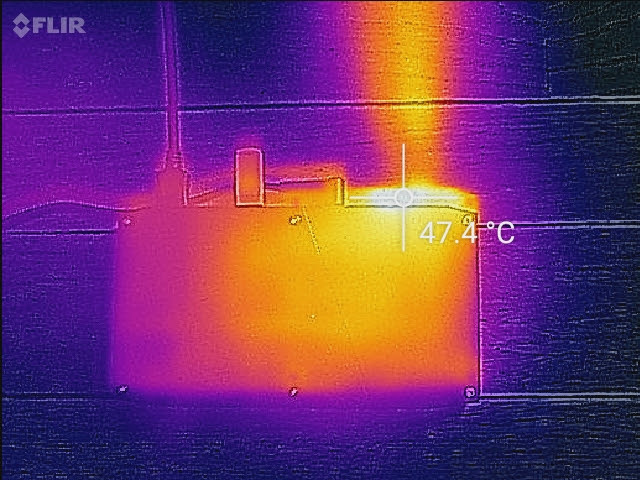 Using the Android version of the FLIR One thermal imager, we observed the chassis temperature after the CPU package temperature reached the steady state value in the above graph. We have additional thermal images in the gallery below. The maximum chassis temperature observed by the thermal imager was slightly above 60 C near the fan's exhaust vent. At that point, a sound level Android app running on the HTC One M7 recorded 59 dB. For comparison purposes, the Zotac ZBOX MAGNUS EN970 recorded 50 dB in a similar scenario.